The VMC Boot Tail Spinnerbait is much like the famous beetle spin. 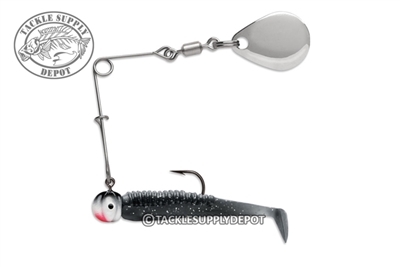 Utilizing a safety pin style attachable spinner arm the Boot Tail Spinnerbait offers flash attraction to the Trigger X Boot Tail Minnow Swimbait. Deadly on panfish and bass the same; the Boot Tail Spinnerbait is an ultimate finesse offering.